So I'm caught up on the laundry, my car is in decent shape, I'm keeping up with most of the housework, and I'm back to my regular writing schedule. However, I realized yesterday that there is a pile of random paper that is going to do me in. And yesterday, that mystery pile did me in. I committed a major parenting sin. I talked up an event...and then realized I had the date wrong and got my kid all excited, only to tell her that I was wrong and we were having an ordinary day at home. I never really tell the girls about fun and out of the ordinary events until the night (or sometimes even the day) before. Madison is only beginning to get a sense of time. So if I tell her on WEDNESDAY that we're doing something super fun on SATURDAY, she gets excited and asks me about it constantly. So I don't do it. She finds out what's going on for a particular day on that day. Then she's excited, and she doesn't have long to wait. No, this won't work forever, and yes, there's something fun about anticipation, but right now, this is what works. Anyway, Friday night, I told that Saturday was going to be a really fun day! We were going to a birthday party! She was so excited! She woke up Saturday ready to party. The issue was...I couldn't find the invitation. I was pretty sure it was in the early afternoon, and I knew the place, but I could not remember what time it started. Adam had been asking me about it, since it was still up for debate as to whether or not I'd be bringing Reagan. If I didn't, he'd have to come home from golf in time. When he left, I still hadn't found the invite. I still wasn't concerned though. I just told him not to worry about it, and if it was on the earlier side, I'd just bring Reagan. The morning went on and my search through the piles still was proving fruitless. Finally, I admitted defeat, and emailed a friend of mine who I knew was also invited. Success! She was happy to hear we were going, and let me know the correct time. And then she clarified that the party was on Sunday. So here I am, completely at fault, and dealing with a very disappointed almost three year old, who isn't great at delayed gratification. She was sad, she was mad, she was in denial. I reminded her that we were still going, that the birthday party was still happening, but it was just one more day of waiting. She did settle, and we made sure to do some fun things at home, she was just as excited about the party today and had a great time, but I felt bad. Not because she had to wait, but because it truly was my fault. And it was something that could have easily been avoided if I had been on top of all the paper that seems to come into my house. Coupons, bills, invitations, magazine clippings. Things to write the on the calendar, things to pay, things to file, things to toss. For an increasingly paperless society, we still get a ridiculous amount of paper coming in. I thought I had a good system. We throw away most junk mail as it comes in. Most of our bills are online and we try to keep most things electronic. Bills that we do get go into the tote bag that I carry around for when I get a moment (and yes, those get dealt with). But I'm bad at the rest of our plan. The plan seems pretty good. I have a folder for coupons to clip, a folder for stuff to file, a folder for paperwork I need to complete, a folder for things to add on the calendar. Then I get busy and just put it on my desk, to be put into the correct folders as soon as I get a moment. And then I build my three year old up and let her down because I am still missing that invitation. 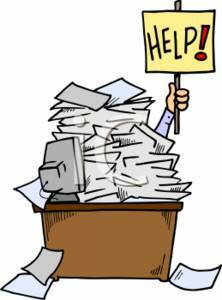 Tomorrow I'll tackle Mount Paperwork (hey, if I can conquer Mount Laundry, I should be able to handle this). And I'll continue lusting after this. The NeatDesk. 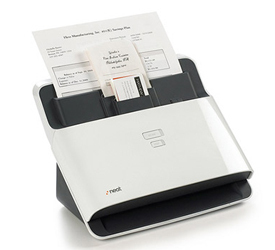 I lust after it every time the infomercial airs (and yes, I know it's basically just a $400 scanner. Shut up. It looks like it would make all my piles magically disappear). And if anyone has any other magical solutions for keeping all the paper organized, I'd love to hear them! Hey NeatDesk, I am TOTALLY available for product reviews. I know you market yourself toward business, but I think you've got an untapped Mom market in need of your organization!